Eddie Moore, MD, has retired from his positions as Professor and Associate Dean for Graduate Medical Education. 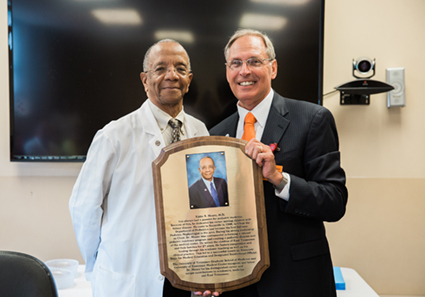 A reception was held in his honor where he was presented with a plaque that honors his contributions to the UT Graduate School of Medicine. Dr. Moore always had a passion for pediatric medicine. Because of this, he dedicated his career to serving children with kidney disease. He came to Knoxville in 1988 to Chair the Department of Pediatrics and become the first full-time Pediatric Nephrologist in the area. 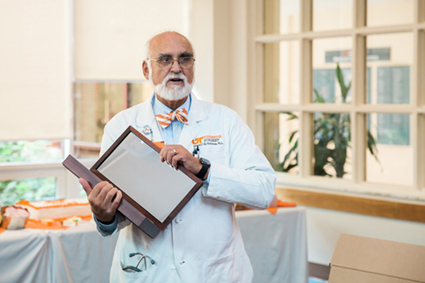 During his leadership as Chair, Dr. Moore was instrumental in forming a pediatric residency program and creating a pediatric dialysis unit at The University of Tennessee Medical Center. He served the children of East Tennessee and their families for 27 years. He fostered compassion and healing through his academic teaching as well as his clinical practice. This led to a successful tenure as Associate Dean for Medical Education and Designated Institutional Official. He retired his duties to move to the West Coast to spend more time with his wife, children and grandchildren. See photos from his retirement reception on Flickr. Mitchell Goldman, MD, has retired as Chair of Surgery, a role he has filled since 1998. Dr. Goldman has a rich legacy, including initiating the Medical Explorations program for high school students as well as completing the first kidney transplant at The University of Tennessee Medical Center in 1985, one year after he came to the medical center as Surgery faculty. In addition to vascular surgery and education, Dr. Goldman has a passion for scientific research. He became the first Assistant Dean for Research at the UT Graduate School of Medicine, a role he will continue in, in addition to continuing as Professor of Surgery. A retirement reception was held in his honor where he was presented with a mirror for "self-reflection." Of his active career, Dr. Goldman said, "If you enjoy what you do, you'll never work a day in your life." See photos from his retirement reception on Flickr. The Knoxville Business Journal has named its 2015 Health Care Heroes, and Medicine faculty Wahid Hanna, MD, Jonathan Wall, PhD, and Robert Overholt, MD, are among the medical professionals honored. Wahid Hanna, MD, Professor and Chief of the Department of Medicine's Division of Hematology/Oncology at the University of Tennessee Graduate School of Medicine and Director of the East Tennessee Comprehensive Hemophilia Center at The University of Tennessee Medical Center, was selected as a 2015 Health Care Hero for Physician for his work in treating hemophilia, a rare, inherited bleeding disorder in which blood does not clot normally and may cause excessive internal bleeding. Dr. Hanna's career in treating blood disorders and cancers began more than 40 years ago and is internationally recognized. Read more about his career treating hemophilia. Jonathan Wall, PhD, Professor and Director of the Amyloidosis and Cancer Theranostics Program and the Preclinical and Diagnostic Molecular Imaging Laboratory, was selected as a 2015 Health Care Hero for Innovation for his advancements in diagnosing and treating amyloidosis, a devastating disease caused by the buildup of protein fibers and sugar molecules known as amyloid. Dr. Wall is currently working toward approval for a clinical trial with the goal of an FDA-approved method to image amyloidosis. Read more about his career in amyloidosis research. Robert Overholt, MD, Clinical Assistant Professor, Medicine, was honored as a 2015 Health Care Hero for Community Outreach for his efforts to educate the public through "The Dr. Bob Show" as well as his work at The Allergy, Asthma and Sinus Center. His show airs four times a week on East Tennessee PBS and WBIR-TV, 10News2. Read more about Dr. Overholt's community outreach. J.W. Hudson, DDS, Professor, Oral and Maxillofacial Surgery, received the William J. Gies Foundation Award during the opening ceremony of the 97th Annual Meeting, Scientific Sessions and Exhibition of American Association of Oral and Maxillofacial Surgeons in Washington, DC. The award recognizes Dr. Hudson's distinguished contributions to oral and maxillofacial surgery education. It is given annually in honor of William J. Gies, PhD, who co-founded the School of Dentistry at Columbia and led to the creation of the American Association of Dental Schools, to honor his name and recognize work that continues his legacy. Dr. Hudson served for 16 years as program director to the OMFS Residency program. He has contributed in the fields of wound healing, hyperbaric medicine and Level I trauma care. Also, he helped formulate the inaugural AAOMS Parameters of Case document for cleft/craniofacial treatment. In 1985, Dr. Hudson started the Hyperbaric Oxygen Therapy Unit at The University of Tennessee Medical Center for comprehensive treatment of osteomyelitis and osteoradionecrosis of the bimaxillary complex. 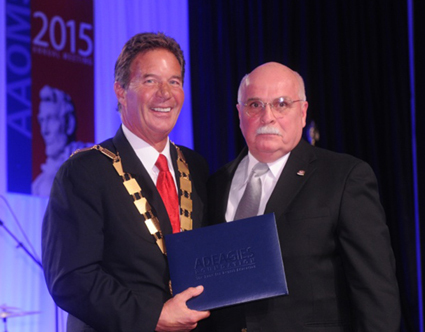 In 2012, he was awarded the Southeastern Society of Oral and Maxillofacial Surgeons' Educator of the Year. He has contributed to and written 40 refereed articles, 11 book chapters, and three books. He was 1 of 12 authors for the 75th edition of the Journal of Oral and Maxillofacial Surgery. 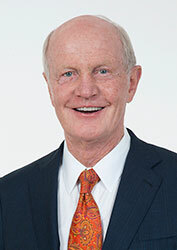 In 2008, he gave the Philip Maloney Presentation for the AAOMS Annual Meeting. Dr. Hudson, a graduate of the UTHSC College of Dentistry, received his certification in oral and maxillofacial surgery at the UT Graduate School of Medicine. He is a diplomate of the American Board of Oral and Maxillofacial Surgery, including a time as a board examiner, and has been an active member on AAOMS committees. "Tenn. hospital works to prevent, treat drug-dependent newborns"
"Knoxville's United Way sets $13,115,00 campaign goal"
"Knoxville attorney continues sharing message after beating ovarian cancer"
"Dr. Wahid Hanna, director of UT Medical Center's East Tennessee Comprehensive Hemophilia Center"
"Jonathan Wall, professor of medicine and lab director, UT Graduate School of Medicine"
"Flu vaccine will be better than last year, CDC says"
"New Imaging Technology May Help Doctors Diagnose Amyloidosis"
"New and expanded business activity"
"UT Medical Center urges flu vaccines for pregnant women"
"Talking to young children about breast cancer"
"Health Literacy: Understanding your Health"
Jennifer Winbigler, MD, Internal Medicine Resident, won first place in the Tennessee Chapter of the American College of Physicians 2015 Narrative Medicine Contest in the Resident/Practicing Physician Category. Dr. Winbigler wrote her essay, "Doctor Daughter," in the final stages of her father's fatal disease from squamous cell carcinoma to chronicle her thoughts as both a physician and a daughter. She describes, from a physician's point of view, the medical details of her father's case. As a daughter, she describes a man who was CEO of an electric company, an SEC football official, and "the BEST dad a girl could ask for." Dr. Winbigler said, "I wrote that the day he went home on hospice, and a week later I was on my way to his funeral. At least he didn't have to suffer for very long. "It was so painful to watch my dad go through this when I help and heal people on a daily basis, but I couldn't do anything for him. It is an honor to be his daughter and a physician, so I'm glad I could write about both. " Her father, Jim Allison, was first diagnosed with head and neck cancer in 2013, and he passed away September 8, 2015. On September 12, Dr. Winbigler and SEC football officials across the country wore black wristbands in memory of her father. Read "Paying Tribute to a VFL" on VolsConnect. 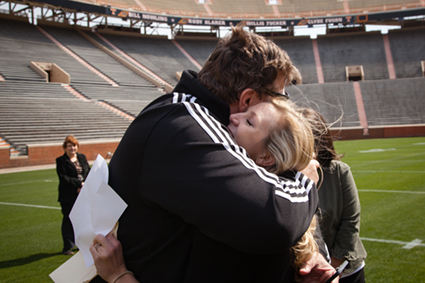 Dr. Winbigler completed several of her medical school rotations in Knoxville and was one of the first residents to celebrate Match Day at Neyland Stadium by running to the 50-yard-line. Her dad, who came to cheer her on, wrote a poem about Match Day to all of the graduating medical students. "Doctor Daughter" will be published in a future issue of the Tennessee Medicine Journal. Brittany Vasquez, fourth-year UT College of Medicine student, was also recognized in the Narrative Medicine Contest. She earned an honorable mention in poetry for her poem, "44 Years and 9 Days." The Scope often features faculty, residents and staff who are at the forefront of advancing our mission of healing, education and discovery. However, behind every story, there are many more staff members whose work supports these advancements, these awards and these breakthroughs. 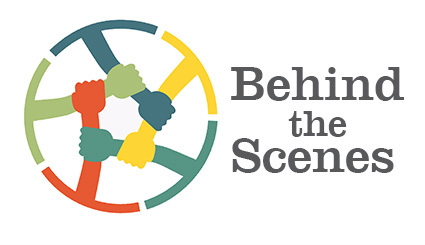 "Behind the Scenes" is an opportunity to put these staff members into the spotlight, introducing them and their work to the community and showing that it takes the work of everyone at the UT Graduate School of Medicine to make a difference in medical education and medical care for our community. 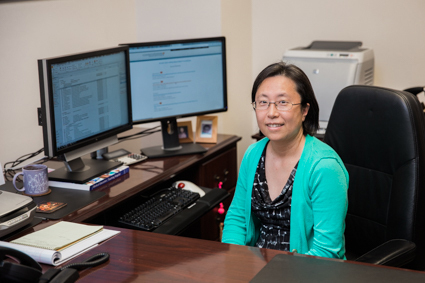 Hurst collects and organizes data related to the Graduate School of Medicine, including scholarly activity, awards, alumni information, and data related to residency program accreditation and compliance. She produces reports and analyses on growth and performance. Her role supports all of the departments at the UT Graduate School of Medicine and residency/fellowship programs. Beyond her work, Hurst says she has been in Japan, Australia, Germany and Knoxville, and she will complete a trip around the globe if she returns to Japan where she was born. Young is certified as an advanced emergency medical technician. He works in University Family Physicians, a primary care clinic operated by Family Medicine faculty and resident physicians at the UT Graduate School of Medicine. With experience in emergency and trauma care, Young is able to help identify patients presenting with life-threatening symptoms. Young also works directly with the residents helping with patient care, performing point of care tests, administering medications and vaccines, and assisting with procedures. Beyond working for UFP, Young hopes to be an inventor of medical technology. He said that when you work in this field, you constantly think of ideas — ways to improve people's lives. In October, Preston Medical Library (PML) staff have several reasons to celebrate. It is National Medical Librarians Month, sponsored by the Medical Library Association. The month provides medical librarians opportunities to raise awareness for their services in searching for and providing reliable health information to healthcare workers. Throughout the month, and every month, librarians and staff have classes available to clinicians to introduce them to the many resources available through PML. October also marks the one-year anniversary of the relocation and expansion of Preston Medical Library to the new University of Tennessee Medical Center Health Information Center (HIC). Through this new center, librarians have been able to assist a much larger community in accessing health-related information. Within one year, the number of people visiting HIC has more than doubled to a monthly average of 7,200. Also during that time, librarians have responded to nearly 5,000 health information requests for patients, their families and community members. This is nearly a 400% increase per month. Expanded services were also made available to academic and clinical patrons through in-depth literature searches and delivery of article journals, enabling the best patient care and research. "I am glad that the hospital opened and operates a service like this. It is important to understand all we can about our bodies and the care thereof, and the Health Information Center can assist us with this." "Any time I need to research a paper or presentation that I am doing, I reach out to the library and they are so helpful in getting the literature I need." 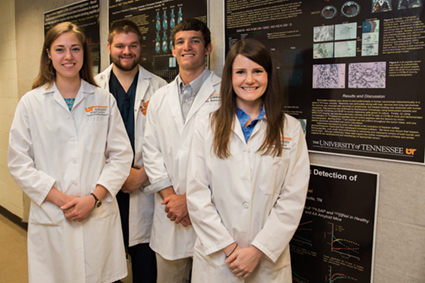 Medical students participated in bench research at the UT Graduate School of Medicine through the I. Reid Collmann, M.D. Medical Student Education Fund to give students an opportunity similar to that of former Dean I. Reid Collmann's own student research experience. The awareness of research's impact on patient care is information that will build a solid foundation for the remainder of the student's medical career. 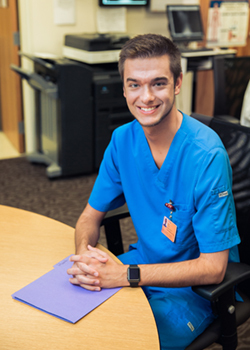 Kyle Boden is a second-year medical student at ETSU Quillen College of Medicine. This summer he worked with Deidra Mountain, PhD, in the Vascular Research Lab in the Department of Surgery. The goal of his project was to gain a clearer understanding of the molecular mechanisms underlying the role of androgen deficiency in intimal hyperplasia development and restenosis. Specifically he studied the effects of androgen deficiency and testosterone replacement therapy on extracellular matrix remodeling, inflammation, and vascular smooth muscle cell proliferation. Adrianna Eder graduated from the Brock Scholars Program at UT Chattanooga in May 2015 and is currently applying to medical school. She performed research in the lab of Michael Karlstad, PhD, testing the hypothesis that steroid-induced insulin resistance will increase the proportion of genetically susceptible mice that advance to diabetes. Furthermore, an objective of her project was to determine if peripheral insulin resistance, determined by an insulin tolerance test, is the early contributor to the increase in blood glucose levels and development of diabetes in genetically susceptible non-obese diabetic male mice. During the first 6 weeks of the study, the mice were administered corticosterone in their drinking water to induce diabetes, and the last 4 weeks of the study will determine if a washout of corticosterone will allow the mice to recover from corticosterone-induced hyperglycemia. Jason Johnson is a second-year medical student at the University of Tennessee Health Science Center. This summer he worked in the Anesthesiology research lab of Ralph Lydic, PhD, and Helen Baghdoyan, PhD. His work focused on the role of the satiety factor leptin and leptin receptors as modulators of pain. These ongoing studies compare the effects of the opiate buprenorphine on nociception among normal weight mice, obese mice lacking leptin, and obese, diabetic mice lacking leptin receptors. Additionally, these studies tested the hypothesis of differential anti-nociceptive effects of buprenorphine between male and female mice. This research is clinically relevant for efforts to understand the mechanisms contributing to increased reports of pain that are associated with obesity. Emily Paulus is second-year medical student at ETSU Quillen College of Medicine. This summer she worked in the research lab of Michael Karlstad, PhD, in the Department of Surgery. Her project studied the effects of bacteria on wound healing in normal and diabetic mice. Treatment and vehicle groups were given two splinted excisional wounds dorsally, and the treatment groups were inoculated with either Pseudomonas aeruginosa, Staphylococcus aureus, or Methicillin-resistant Staphylococcus aureus. The rates of healing and the comparative histochemistries were evaluated using quantitative imaging analysis. The results of her work precede the implementation of an atmospheric plasma applicator that is predicted to destroy biofilm formation. Generally, biofilms found on diabetic patient wounds cannot be treated and are why many patients require amputation. The overall aim of this study is to demonstrate that the atmospheric plasma applicator will be an effective therapy for biofilm-compromised wounds, which could ultimately prevent the need for amputation due to diabetic complications. 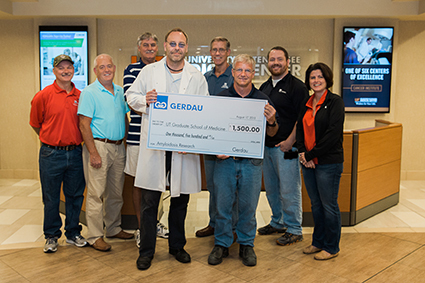 Representatives of steel recycler Gerdau's Knoxville mill recently donated $1,500 to the University of Tennessee Graduate School of Medicine in memory of Arlan Piepho, former Gerdau Knoxville vice president and general manager. The donation, raised through the company's third annual golf tournament held in Piepho's honor, supports a research team initiated by Alan Solomon, MD, Professor Emeritus, seeking to find better treatments for primary amyloidosis, a rare and devastating disease that took Piepho's life at age 63. 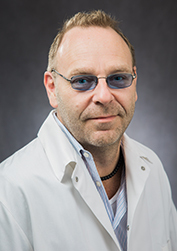 "We cannot make a difference in the lives of amyloidosis patients without support from companies like Gerdau," said Jonathan Wall, PhD, Director of the Amyloidosis and Cancer Theranostics Program and who was recruited to the UT Graduate School of Medicine by Dr. Solomon, to study amyloid. "These funds will help us to find new ways to diagnose and treat the disease." The golf tournament was held at Egwani Farms Golf Course in Rockford and drew 44 participants. Gerdau held a second golf tournament on May 19, at Centennial Golf Course in Oak Ridge. This tournament, benefiting veterans, included 40 participants and raised $1,200 for the East Tennessee Veteran's Honor Guard. This was the first time the mill held two golf tournaments in the same year. "The tournaments provided the opportunity for fun, camaraderie and healthy competition," said Johnny Miller, vice president and general manager of Gerdau's Knoxville steel mill. "More importantly, they helped us raise money for three very worthy causes. "Based on the success of these tournaments, Gerdau plans to continue holding two annually, with proceeds from one going to Dr. Solomon's research [continued, since his retirement, by Dr. Wall and the research team] and the second going to a different charity each year," Miller said. On June 6, the Randy Atchley Memorial Bass Tournament was held in honor of former Gerdau employee and avid fisherman Randy Atchley, who died at age 51 as a result of heart problems. The tournament took place at Louisville Point Park, drew 32 participants and raised $1,000 for the American Heart Association. Gerdau, a leading producer of long steel in the Americas and one of the largest suppliers of special long steel in the world, has a robust social responsibility program that focuses on providing community support in the locations where its business operates. Pillars under the social responsibility program are health and wellness, history and culture, education and affordable housing. Gerdau has over 45,000 employees and industrial operations in 14 countries with operations in the Americas, Europe and Asia, which together represent an installed capacity of over 25 million metric tons of steel per year. It is the largest recycler in Latin America and around the world it transforms millions of metric tons of scrap into steel every year. Gerdau is listed on the stock exchanges of Sao Paulo, New York, and Madrid and has around 140,000 shareholders. For more information, visit http://www.gerdau.com/northamerica. 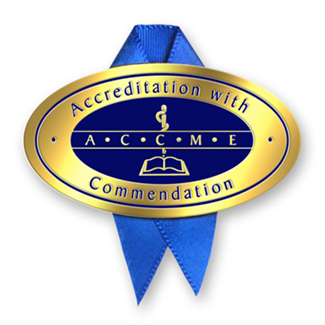 For the second accreditation cycle in a row, the statewide UT College of Medicine continuing medical education offices have received Accreditation with Commendation from the Accreditation Council for Continuing Medical Education. 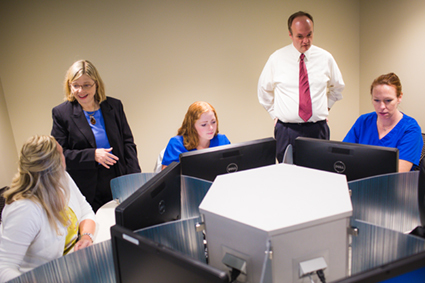 Jointly, the Graduate School of Medicine Office of Continuing Education and Professional Development and the CME offices at UT College of Medicine in Chattanooga and Memphis earned the top-level accreditation during the UTCOM six-year reaccreditation review. The University of Tennessee Medical Center and UT Graduate School of Medicine empower its team members to impact the patients, campus and one another through the annual Team Member Giving Campaign. With more than 25 percent team member participation, team members demonstrate the true philanthropic spirit of the medical center — and that it is worthy of the community's financial support. To learn more about how to get involved or to share a "Why I Give" story, contact Jessica Benko in the Development office. Bertha Jarnagin's tenure began in 1985 when she became a hospital employee. Her career in healthcare, though, had actually started many years before in 1959 when she went to work for Dr. Robert Lash at his office off Chapman Highway. Since then, she's been witness to, or part of, just about every significant change that has impacted the hospital, community and healthcare industry. 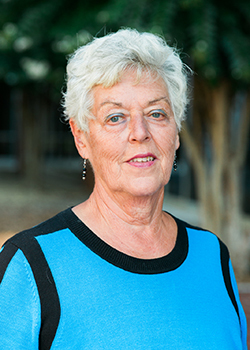 From her work in the County Medical Examiner's Office to her support of the early planning and launch of UT Lifestar, the Family Medicine Residency Program, the Telemedicine Program and the Medical Explorer's Program, Jarnagin's passion for her work and depth of knowledge is unparalleled. In fact, Jarnagin recently received the UT Graduate School of Medicine's Excellence in Leadership award for her work as an Administrative Specialist in the Department of Radiology, and more specifically, the time she dedicates to the Radiology residents. Jarnagin's philanthropic spirit — both professionally and personally — has been unwavering as she knows how "important this place is to the patients and community it supports." In addition, Jarnagin and her husband of 46 years, Jim, actively support and participate in local 4-H club initiatives. Jarnagin went on to say she supports the Radiology Research & Education Gift Fund through the Team Member Giving Campaign because, "I love being helpful and doing what I can." The Radiology Research & Education Gift Fund was originally established to help ensure continued excellence for all departmental programs, including patient services, education and research at The University of Tennessee Medical Center and University of Tennessee. Funds may be used to provide fellowships, scholarships and research grants for residents, purchase equipment used for improving patient care, research and education and beyond. The Department of Radiology - including 170 employees, 23 attending physicians and residents in a four-year diagnostic radiology program - offers a range of imaging services and performs more than 260,000 procedures annually. Statistics show that half of American adults cannot understand or act on the health information they receive. 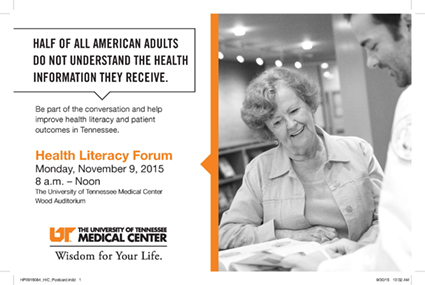 With health literacy as an important area of concern, health care professionals, educators, librarians, government officials and business leaders will participate in a Health Literacy Forum on Monday, November 9, from 8 a.m. to noon at The University of Tennessee Medical Center. The community is invited to be part of the conversation. The forum will focus on one of the goals of the U.S. Department of Health and Human Services' National Action Plan to Improve Health Literacy: "To promote changes in the health care delivery system that improve health information, communication, informed decision-making, and access to health service." Inter-professional Collaborations and Best Practices in Patient Education to Improve Medication Adherence with Andrea Franks, PharmD, BCPS, UT Health Science Center College of Pharmacy and UT Medical Center; and Hamilton Borden, PharmD, Blount Discount Pharmacy and UT Health Science Center College of Pharmacy. Strategies for Health Information and Library Professionals to Improve Patient Engagement and Communication with Terri Ottosen, MLIS, AHIP, Consumer Health Coordinator, National Network of Libraries of Medicine, Southeastern Atlantic Region. The half-day forum is free, but registration is required by calling 865-305-9525 or by visiting online at utmedicalcenter.org/events. On the calendar, go to November 9, click on the class and the registration form will appear. For more information contact Sandy Oelschlegel, UT Medical Center Health Information Center, at soelschl@utmck.edu or 865-305-952. The University of Tennessee Graduate School of Medicine presents the Twelfth Annual Hematology Conference: An Update on Selected ASH Topics, scheduled for Saturday, February 6, 2016, University of Tennessee Conference Center, Knoxville. It is approved for AMA and ACPE credits and CEUs. Register today. The annual update occurs as soon as possible after the American Society of Hematology (ASH) international conference, while allowing time for the featured speakers to develop unique presentations combining their areas of expertise with new information garnered from the ASH presentations. 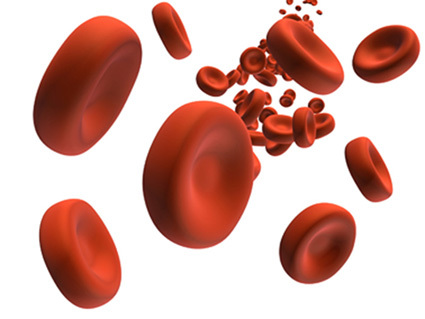 The conference provides updates on studies and recent advances in the treatment of blood cancers, including hemostasis/thrombosis, chronic lymphocytic leukemia, myelodysplastic syndromes, multiple myeloma and malignant lymphoma. At the conference, optimizing drug therapy in cancer patients and identification and prevention of drug interactions in cancer patients will also be discussed. Nationally acclaimed experts in their fields will lead discussions, including Thomas Habermann, MD, Mayo Clinic; Michael Keating, MB, BS, MD Anderson Cancer Center; Craig Kessler, MD, Lombardi Cancer Center; Rami Komrokji, MD, H. Lee Moffitt Cancer Center; and Sagar Lonial, MD, Winship Cancer Institute. 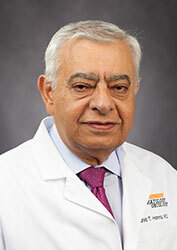 The update is directed by Wahid Hanna, MD, Professor, UT Graduate School of Medicine. Learn more about the conference and register.